This easy, crunchy haystacks candy has long been a favorite treat. It takes just minutes to make with chow mein noodles, peanuts, and butterscotch chips. The microwave oven makes them particularly fast and easy. 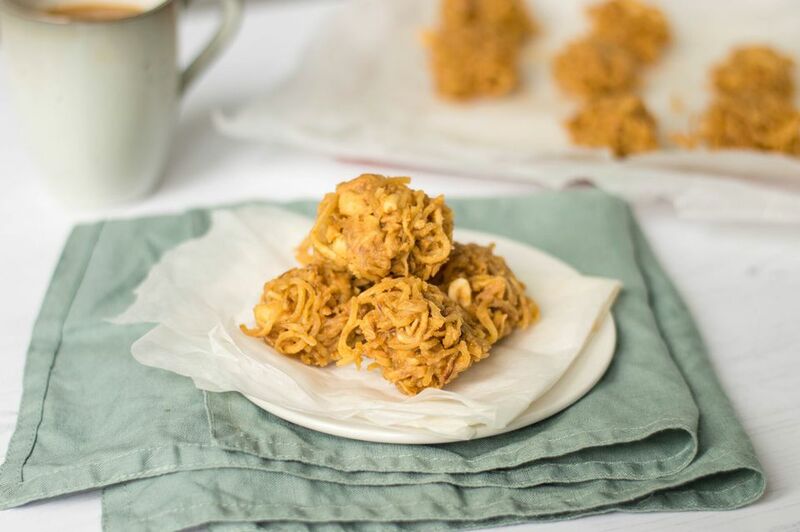 Haystacks are even easier than no-bake cookies and bourbon balls! The simplicity of this candy makes it hugely popular, and it is so delicious. The candy will be a hit wherever you take it! If you take it to a party, make sure you take a few copies of the recipe. You'll have lots of requests! The candy is easy enough for small children to help make with a little supervision, and teenagers should have no problem making them with little or no help from mom or dad. See the tips and variations for the double boiler method and some creative variations. Lay a sheet of waxed paper or parchment paper on the countertop. Put the butterscotch chips in a medium microwave-safe bowl or container. Microwave on 50% power for about 3 to 5 minutes, or just until the butterscotch chips are melted. Add the peanut butter, peanuts, and chow mein noodles; stir gently to coat the noodles thoroughly. Drop by teaspoonfuls onto the waxed paper or parchment paper. Let them stand at room temperature until set. Transfer them to a container, separated by sheets of waxed paper. To fix the candy in a double boiler, put the butterscotch chips in the top of a double boiler or stainless steel bowl over hot water (simmering, not boiling). Cook until the butterscotch chips have melted, stirring constantly. Remove from the heat and transfer the melted chips to another bowl, if necessary, and proceed with the recipe. For a double recipe, use 2 cups of butterscotch chips, 1 cup of peanut butter, 1 cup of peanuts, and 4 cups of chow mein noodles. Make the haystacks with chunky or super chunky peanut butter. Omit the peanuts and add 2 cups of miniature marshmallows along with the chow mein noodles, or add about 1 cup of miniature marshmallows in addition to the peanuts. Replace the butterscotch chips with peanut butter chips or semisweet chocolate chips. Or use half butterscotch and half peanut butter or chocolate chips. Add raisins or dried cranberries to the haystacks. Replace the peanuts with candy-coated chocolate pieces (M&Ms). Use cashews, chopped pecans, hazelnuts, or walnuts in place of the peanuts or omit the peanuts with no replacement. Replace half of the chow mein noodles with Golden Grahams or a similar crunchy cereal.